Bert Collins is a noted Ojai Valley artist, painter and teacher who has won more than 200 awards during her 40+ year career. Her realistic scenes contain naturalistic color and fine detail. She is a member of the Santa Barbara Art Association and the Ventura County Pastel Artists Association. Galleries in cities such as Palm Springs, Newport Beach and Beverly Hills have represented her. In 1997 she was honored by the City of Ojai for lifetime achievement in the arts. 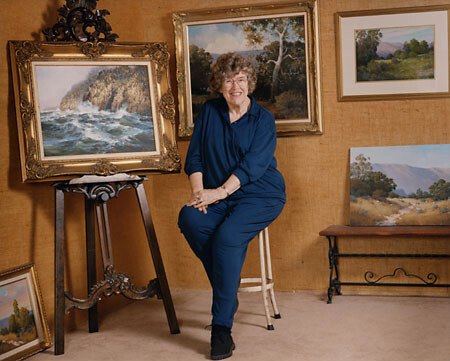 She, along with Marta Nelson and Gayel Childress, founded the Ojai Studio Artist’s Tour in the late 1980s. The results have been thousands of dollars contributed to arts education as well as tremendous economic vitality to the Ojai Studio Artists and the community of Ojai. In addition, these three women have been instrumental to the success of the Ojai Art Center helping to shape its future for generations to come. Bert Collins’ documentation took place in 2005 and was sponsored by Ojai Studio Artists, Natalie’s Eclectables, Dennis Mitchell at Matiz Salon and Passion Flowers. The FOTM Archive contains extensive information about this artist.